As the 2015 Armory Commissioned Artist, Abu Hamdan has developed a series of works specifically for the fair, as well as a limited edition artwork benefiting the Museum of Modern Art. A Convention of Tiny Movements is a project dispersed throughout the fair, and it is comprised of a new audio essay, a series of amalgamated objects, and a specifically designed series of 5,000 potato chip packets, distributed as a free souvenir. 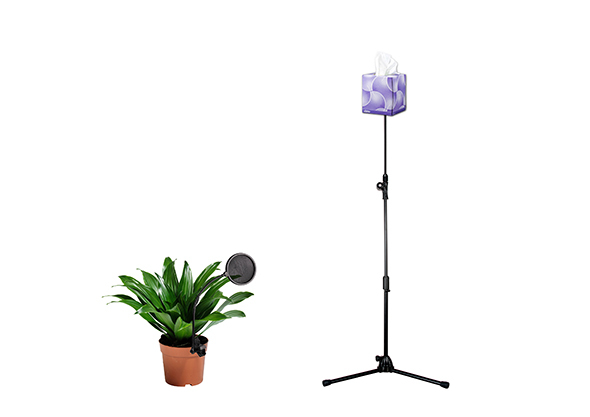 This collection of works proposes a series of ways to approach, inhabit, and conceive of the new aural world that emerging audio technologies, such as voice stress analysis, are forging. This collection of works warns us of increasing surveillance, but also for the first time allows us to hear the world from the perspective of objects—a new way of listening to our world that breaks down that all-too-tidy divide between the subject and object. A Convention of Tiny Movements will be on view throughout The Armory Show; additional work by Abu Hamdan will be on view at Galeri NON (Istanbul), located in the Focus MENAM section on Pier 94. Operating as a fence of cedar trees located at the entrance to the VIP Lounge on Pier 94, this installation confronts passersby as an organic wall, asking them to consider their position as guests or potential trespassers in the vicinity of this exclusive area within the fair. The concept of the natural fence has played a significant role in the contentious battle for the privatization of common lands cross-culturally. Art Jameel and Edge of Arabia will present the latest iteration of CULTURUNNERS, an ongoing artistic expedition co-authored by Azra Aksamija and Stephen Stapleton that hosts artistic exchanges between the United States and the Middle East. Sited in a mobile artist studio in the form of a modified RV, CULTURUNNERS at The Amory Show will feature custom-built artistic technologies to map, archive, and broadcast voices and ideas from the FOCUS: MENAM section of the Fair. CULTURUNNERS includes projects by Azra Aksamija, Dietmar Offenhuber, Nick Beauchamp, Chris Riedl, Darvish Fakhr, Madeleine Gallagher, John Steiner and Orkan Telhan. FREEWAY, the online broadcast platform of Edge of Arabia’s ongoing US Tour in partnership with Art Jameel, will present stories connecting Focus: MENAM to communities across Manhattan such as Little Syria (on the Lower East Side) and Harlem. This will include a live podcast radio and three short documentaries directed by Husam Al–Sayed, filmmaker and co-founder of Telfaz 11, with scores composed by SALAR, performance artist, electronic composer, co-founder of the Analog Room. Both artists are in the US courtesy of the Art Jameel Residency at the Elizabeth Foundation For the Arts. FREEWAY is co-curated by Ava Ansari and Stephen Stapleton. 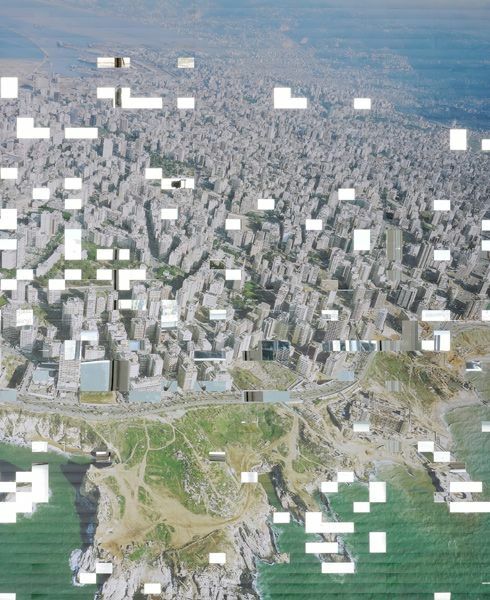 This interactive sculpture, composed of over 3,000 removable photographic components containing the words “Beirut does not exist” on the reverse, creates an adjustable map of Beirut as it invites viewers to rearrange, remove, and even take away portions. As the fragments are gradually removed, an underlying mirror is revealed, reflecting the viewer and the installation’s surroundings. Located at the Pommery Champagne Bar on Pier 94, this installation embodies a reading of Beirut – a city which is in perpetual mutation and movement – as a site for the production of multiple meanings and fantasies. This installation compares two codes of ethics, the former from the American West and the latter from the Islamic code, referring to statements or actions of the Prophet Muhammad, known as the Hadith. The Cowboy Code (Hadith), located in the Focus Lounge on Pier 94, is composed entirely of the red plastic toy gun caps, canonical with the image of Western Cowboys and tropes of Mater’s childhood and US popular culture. 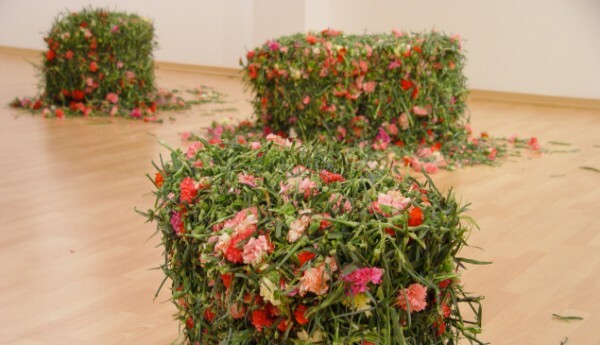 Comprising bales made from carnations bound by metal wire, this installation, ephemeral and symbolic, will change throughout the show as carnations fall and become spread about the area, stimulating the viewer’s sense of smell and touch. Incarnation will be displayed in the Pier 94 Focus Lounge. This interactive puzzle engages the public to re-assemble a territorial map of the Middle East made from suspended plastic magnets, with each fragment consisting of one the region’s actual nation states. Located in the Pier 94 Focus Lounge, this work is a play on the so-called “New Middle East Map,” a plan that has been distributed in various conspiracy theory circles, as well as in some mainstream media, since its inception in June 2006. Following the critical success of Venus Drawn Out, last year’s special project on Pier 92 – Modern, The Armory Show is pleased to announce Parviz Tanavoli: Selections from the NYU Art Collection, which will present key early works by this celebrated figure in modern Iranian art. Although Tanavoli is widely heralded for his sculpture, the Grey’s presentation features a selection of paintings, drawings, prints, and jewelry, in addition to ceramic and bronze three-dimensional works. Featuring approximately 25 works, this special project has been co-curated by the Grey Art Gallery’s Director, Lynn Gumpert, and Associate Director, Michèle Wong. ARAB DOLLS consists of a limited edition collection of sixty dolls rising from the ground in fifteen symmetrical rows. At first glance, the hollow objects are sleek and slick in a sea of familiar black, but a smaller collection of white dolls, each finished with a coating of gold leaf inside, disrupts that uniformity. Massoud’s installation addresses the function of the veil in the Arab world and the Western interpretation of that function, challenging preconceived notions of gender roles within Arab society. ARAB DOLLS: Maya, Zeina, Racha and Yara is curated by Maria Cristina Didero.